The EUMETSAT (European Organisation for the Exploitation of Meteorological Satellites) is an intergovernmental organization created through an international convention agreed by a current total of 27 European Member States: Austria, Belgium, Croatia, the Czech Republic, Denmark, Estonia, Finland, France, Germany, Greece, Hungary, Ireland, Romania, Italy, Latvia, Luxembourg, the Netherlands, Norway, Poland, Portugal, Slovakia, Slovenia, Spain, Sweden, Switzerland, Turkey, and the United Kingdom. These States fund the EUMETSAT programs and are the principal users of the systems. EUMETSAT also has 4 Cooperating States. Cooperation agreements with Iceland, Lithuania, Bulgaria and Serbia have entered into force. 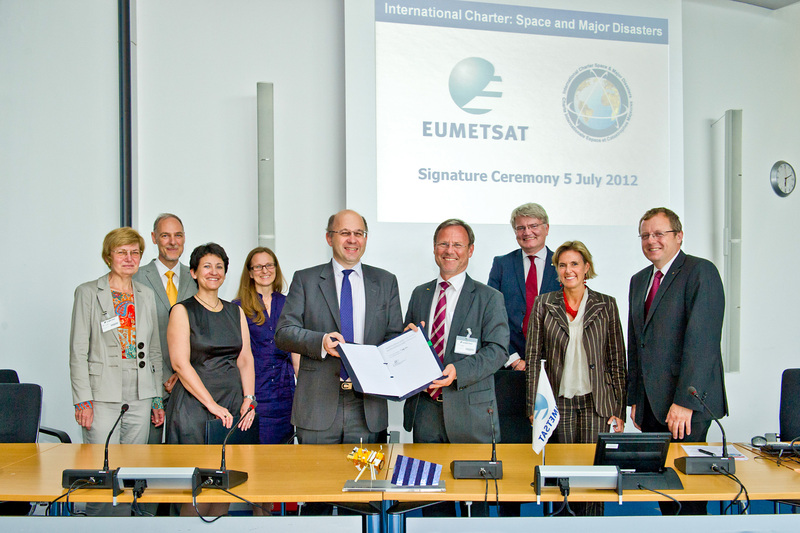 The convention establishing EUMETSAT was opened for signature in 1983 and entered into force in 19 June 1986. The activities of EUMETSAT contribute to a global meteorological satellite observing system coordinated with other space-faring nations. EUMETSAT is not part of the European Union.